Cornus kousa chinensis is a small tree from Asia. 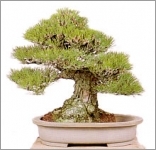 Making a beautiful bonsai tree it can also grow about 20 feet tall in the wild. Winter reveals a very attractive mottled tan and gray exfoliating bark and a distinctive horizontal branching pattern. 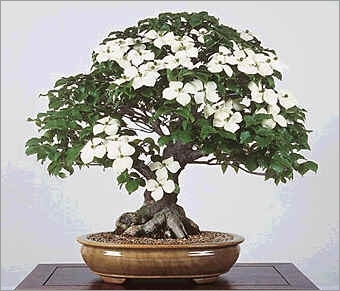 Chinese kousa dogwood grows in a widely vase shaped to rounded form with a dark green foliage. An added bonus is a reddish Fall color that ranges to reddish purple and scarlet depending on climatic conditions. Clouds of white blossoms appear after the leaves in early Summer. Blossoms last as long as six weeks. The flowers are set among the leaves, instead of on the bare branches. The four white bracts, which are pointed at the tip, are greenish at first, then gradually change to a beautiful creamy white; one of the most beautiful of all flowering trees. Edible red fruits form in late Summer and persist through the Fall. They dangle like oversized raspberries beneath the horizontally arching branches.